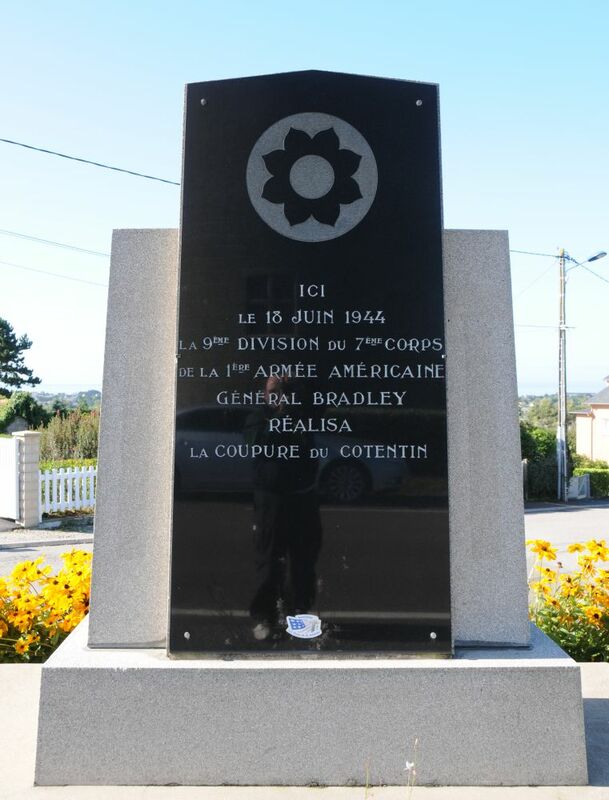 When General Bradley on the 9th June established the high priority for the seizure of Carentan and the firm junction of the V and VII Corps beachheads, he also directed that the 4th and 90th Infantry Divisions were to maintain pressure in the direction of Cherbourg, and that the 9th Infantry Division and the 82nd Airborne Division were to complete the blocking of the Peninsula in the vicinity of St. Lo – d’Ourville and la Haye du Puits. The original Corps Field Order stated that the 9th Infantry Division was to begin landing on D-Day plus 4 (June 10th 1944) and assemble as soon as practicable in the Colomby – Orglandes area, and prepared for operations to the northwest. It was not anticipated that the 9th Division would have to fight its way to this area, but the slow progress of the 90th Division foreshadowed a serious delay in securing the Douve River line and in blocking the enemy’s western reinforcement corridor. On the 12th of June, therefore, General Collins decided to commit the 82nd Airborne Division and the 9th Infantry Division in the westward attack. The 82nd Airborne Division was to concentrate on the north bank of the Douve west of the Merderet and to advance westward; the 9th Infantry Division was to cross the Merderet for operations in conjunction with the Airborne Division. The 9th Infantry Division, under command of General Manton S. Eddy, had begun to debark on Utah Beach on 10th of June 1944, as planned. The 39th Infantry Regiment was attached to the 4th Infantry Division to assist in clearing the coastal area to Quineville. The remainder of the Division was unloading rapidly enough to be ready for commitment on the 14th of June. Late on the 12th of June the 9th Infantry Division received a warning order from VII Corps, alerting it for a possible movement westward across the Merderet River. General Collins issued more detailed orders verbally the next day. They provided for a coordinated attack by the 9th Infantry and 82nd Airborne Divisions on the 14th of June. Both Divisions were to pass through the 90th Infantry Division, the 82nd attacking along the Pont l’Abbe – St. Sauveur-le Vicomte highway toward St. Sauveur-le Vicomte, while the 9th Infantry Division attacked on its right toward Ste. Colombe. The two Divisions thus took over the 90th Division’s objective, the line of the Douve River. In addition, the 9th Infantry Division had the further mission of crossing the Douve River and blocking of the Peninsula west of the Prairies Marecageuses. The 90th Division was given a new objective. After the other Divisions had passed through, it was to pivot northward on Beauvais and establish itself on the east-west line from Montebourg Station to the bend in the Douve River at Terre de Beauval, thus covering the north flank of the 9th Infantry Division as the latter drove westward. Meanwhile, in view of the previous slow progress of the 90th Division, General Collins asked General Bradley for a replacement and was given the 79th Division, which, however, was not to be employed until later. When the 359th Infantry (part of 90th Infantry Division) in the center had begun to turn gradually north, they opened up a gap in their 90th Infantry Division front near Gottot. Into this gap the first elements of the 9th Infantry Division were committed. The gap was at first only wide enough to permit the employment of one Battalion. The 60th Infantry Regiment of the 9th Infantry Division therefore launched its initial attack in a column of Battalions, the 3rd Battalion leading. As the northward turning maneuver of the 90th Division continued on the right and the 82nd Airborne Division on the left drove almost straight west, the 9th Infantry Division zone in the center widened. The initial objective of the 60th Infantry Regiment was Renouf. From there it was to advance northwest to the high ground west of Orglandes. After the advance started, the 60th Regiment men were under rifle, mortar, and Artillery fire from the line of departure and movement was slow. But by mid-afternoon the two lead companies had pushed up the road to Renouf, with Company K/60 occupying the town at 1800. The 2nd Battalion was then brought up on the right and, advancing abreast, the 2nd and 3rd Battalions reached the Valognes – Pont l’Abbe highway by dark. Shortly before midnight General Eddy ordered the 60th Infantry Regiment to attack at 0500 the next day, 15th of June, and push on vigorously, since enemy reinforcements from the German 265th Division were reported to be moving up. 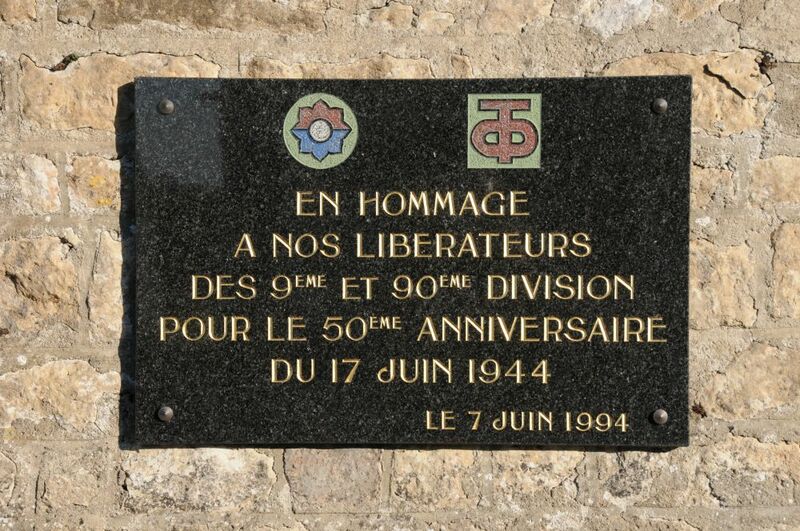 First Army had sent word of the arrival of this Division in the area of St. Sauveur-le Vicomte, and this report was confirmed on the 15th June when the 82nd Airborne identified two Regiments of the 265th Division, the 894th and 895th Regiments. While the 60th Infantry Regiment made good progress north-westward, the 359th Infantry of the 90th Division, turning north-northwest toward Orglandes, was opposed stubbornly, field by field. The two lead Battalions became separated when the 2nd Battalion failed to keep abreast of the 3rd, and enemy riflemen infiltrated into this gap, nearly encircling the 3rd Battalion for part of the day. The attack of the 9th Infantry Division (initially only the 60th Infantry) was coordinated with that of the 82nd Airborne Division. It began at 0500 on 15th of June and ran into the last determined resistance offered by the enemy east of the Douve River. Shortly after the attack started, the 90th Division reported sixteen tanks moving south from Orglandes. These tanks apparently did not constitute part of any coordinated infantry-tank counterattack, for no determined thrust developed. Bazookas and 57-mm. anti tank guns knocked out three Mark III’s and forced the rest to withdraw. The 60th Infantry Regiment lost two anti tank guns. By 0900 the Regiment had advanced approximately 500 yards beyond the Orglandes – Bonneville road, where the 1st Battalion on the right was strongly counterattacked by four tanks and an estimated Battalion of infantry. It was thrown back 500 yards to the road. The commanders of both Companies A and B were lost in this action and the Battalion suffered other casualties. The 2nd Battalion, immediately to the rear, countered the enemy thrust, however, and regained half the lost ground. 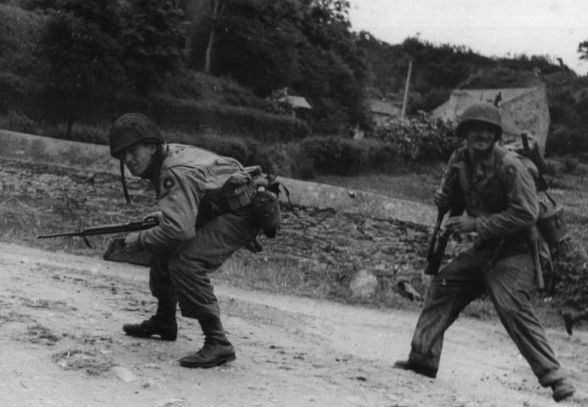 Two men of the 9th Infantry Division carefully advance in Normandy, June 1944. During the morning, the Division commander had shifted the 60th Infantry Regiment‘s axis of attack slightly, assigning to it the mission of taking Reigneville and, as the 359th Infantry turned north and the 60th Infantry Regiment attacked west, it became feasible to commit another Regiment. The 47th Infantry Regiment (part of the 9th Infantry Division) was brought in on the 60th Infantry Regiment’s right and given their former objective, which was the high ground west of Orglandes. 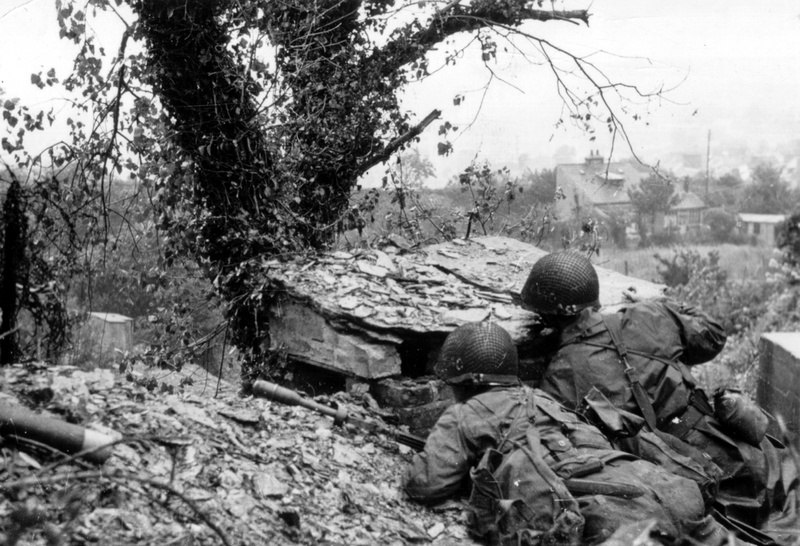 Men of the 47th Infantry Regiment advance in Normandy. The 47th Infantry Regiment moved out shortly after noon, the 1st Battalion leading. The Companies were initially so widely spread that the 3rd Battalion could not jump off until about 1630. It advanced rapidly, however, and reached the forward slopes of the objective by dark. The situation on the northern flank caused some concern, as the 1st Battalion was held up for some time by fire from Orglandes on its right rear. Late in the afternoon the 1st Battalion forged ahead again, easing the situation on the 3rd Battalion’s right. It exposed itself, however, and was then echelon-ed to the right to protect that flank. 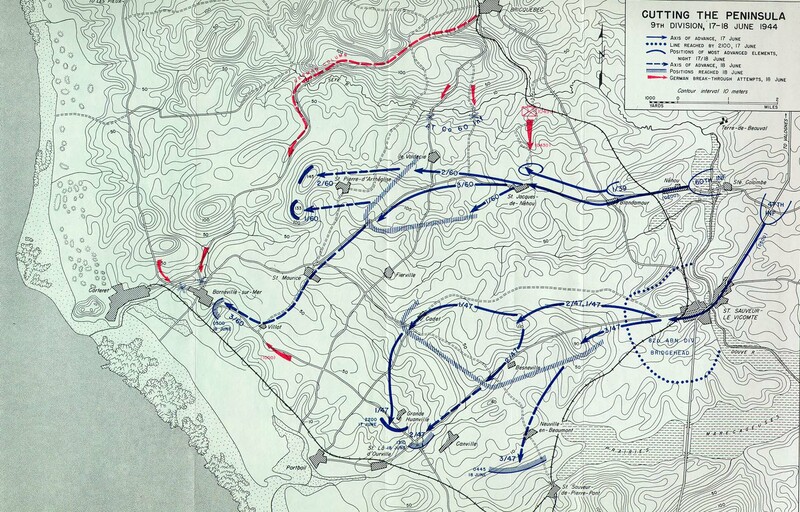 This maneuver became characteristic of the entire “3-Division front” on the 15th of June. Not only was the attack fanning out west to northwest, but the enemy was apparently pivoting his withdrawal to give up his north-south line in favor of one generally east-west, athwart the Peninsula. The enemy’s left, opposing the 90th Division, consequently became the anchor of his resistance and the 9th Infantry Division and the 82d Airborne Division, attacking westward, cut obliquely at his withdrawal routes. In each case, therefore, the American right flank units found themselves bucking the strongest enemy opposition while the left flank units advanced with comparative ease. The exact strength of the enemy was unknown. Elements of the 77th Division and 265th Division were identified by the 9th Infantry Division and 82d Airborne Division respectively. In general, however, the Germans seemed to be delaying with small groups and taking advantage of good defensive ground which compensated in part for their numerical inferiority. To keep the enemy from reinforcing and organizing a better coordinated defense, it was essential to push to the Douve River line quickly. On the afternoon of the 15th of June, General Collins ordered the 325th Glider Infantry to advance to the Rauville ridge line without regard to the actions of the Regiment on its right. The 505th Parachute Infantry was to try to advance to the same line, but its right was to be refused in order to maintain contact with the 60th Infantry Regiment. Similarly the 47th Infantry Regiment’s right was to tie in with the 359th Infantry. In the afternoon of the 15th General Collins announced: “The major effort of the Corps is now to cut the Peninsula.” By this time the advance westward had progressed sufficiently so that the entire effort could be focused toward that end. For the 16th of June General Collins ordered an attack all along the line from the Douve river to Gourbesville. The 82nd Airborne Division was to continue toward St. Sauveur-le Vicomte. The 358th Infantry was to attack northwest from Gourbesville, and the 9th Infantry Division, advancing between the 90th and the 82nd Divisions, was to seize the rough arc formed by the line Reigneville – Hautteville – Bocage – Orglandes – Gourbesville. The 39th Infantry Regiment was now to be committed on the right of the 359th Infantry, which was placed under the 9th Infantry Division commander in order to establish proper coordination and control. The Division was therefore to attack with four Regiments in line from right to left-the 39th, 359th, 47th, and 60th. Developments in the vicinity of St. Sauveur-le Vicomte suddenly changed the whole tempo of the battle. 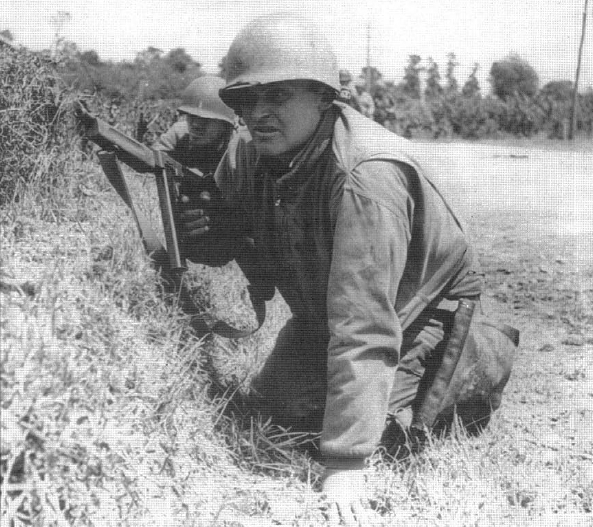 The 82nd Airborne and 9th Infantry Division units jumped off at various times between 0500 and 0800 on the morning of 16 June, but it was the attack of the 325th Glider Infantry, assisted by tanks of Company A, 746th Tank Battalion, which touched of the complete rout of the remaining enemy units east of the Douve River and paced the 2-Division drive to the Douve line. The events at St. Sauveur-le Vicomte were a turning point in the whole drive westward. The success of the 82nd Airborne Division gave such impetus to the 9th Infantry Division‘s attack that it gathered a momentum which carried it swiftly across the Peninsula. When the 9th Infantry Division had jumped of early in the day its initial objectives were Reigneville (60th Infantry), Hautteville-Bocage (47th Infantry), Orglandes (359th Infantry), and the ground west of Gourbesville (39th Infantry). The attack had just begun when the order was given to push hard to the Douve River. Even before the 82nd Airborne Division achieved the breakthrough at St. Sauveur-le Vicomte, there had been signs that the enemy was withdrawing west of the Douve River. Heavy enemy traffic through St. Sauveur-le Vicomte had been observed during the night. At 1130 General Collins called 9th Division Head Quarters and ordered General Eddy to have the 60th and 47th Infantry Regiments push hard to Ste. Colombe with the 39th Infantry swinging around to protect the flank. General Eddy immediately ordered the 60th Infantry Regiment to push all three Battalions to the river. Early in the afternoon he urged the 47th Infantry Regiment (under command of Colonel George W. Smythe) to get on the high ground east of Ste. Colombe, over which the Valognes – St. Sauveur-le Vicomte highway ran. In the Hautteville – Bocage and Biniville area the 47th Infantry Regiment met stubborn resistance, as expected, for this high ground was the last on which the enemy could make a stand east of the Douve. Shortly after General Eddy issued his orders at 1330, news of the 82nd Airborne Division’s crossing of the Douve was received and General Collins designated Colleville and Ste. Colombe as the 47th Infantry Regiment’s objectives. During the day the 47th Regiment pushed well beyond Biniville and established itself on the main highway. 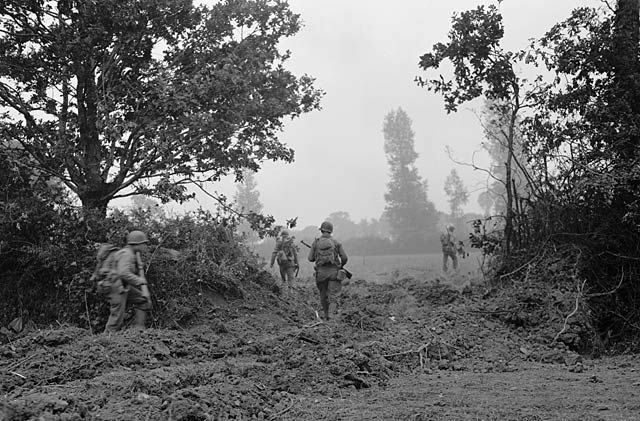 Coupled with the pace-setting drive of the 325th Glider Infantry, the rupture of the German defenses south of Orglandes by the 9th Infantry Division won the battle to sever the Peninsula. Meanwhile the 39th Infantry cleared the ground west of Gourbesville and the 359th Infantry pushed up to the black-top road leading into Orglandes from the east. At that point it was halted. To make it possible for the 39th Infantry Regiment to get behind the 47th Infantry Regiment and help protect the north flank of the Division, it was decided that the 39th would make a left turn and attack across the front of the 359th Infantry into Orglandes. But a counterattack developed east of the town and the attack was delayed until evening. The 1st Battalion, which led the assault, was unable to clear the village that night. The 359th Infantry’s movement north was also held up. The 2nd Battalion, 60th Infantry Regiment, meanwhile had begun to lead the important push to Ste. Colombe, with the intention of establishing a bridgehead over the Douve River. With the seizure of the bridges at St. Sauveur-le Vicomte and Ste. Colombe, the 82nd Airborne Division and the 9th Infantry Division had completed the mission of clearing the east bank of the Douve River as far north as Ste. Colombe. Good progress was made on the 16th of June. In this sector the Germans continued to offer greater resistance than from the west. The enemy was withdrawing on all fronts, but withdrawal to the north was accompanied by considerable fire. The northern flank of the 9th Infantry Division was exposed to attack as the Division moved westward toward Ste. Colombe. Both Corps and Division commanders took precautions to guard the northern flank. General Collins ordered that, in the vicinity of Biniville, all anti tank guns were to cover the roads and trails to the north, since any enemy attack was likely to come from that direction, and the 47th Infantry Regiment was ordered to establish defenses in this area. Meanwhile plans were made to exploit the bridgehead over the Douve River and to cut the Peninsula. The 60th Infantry was to cross the Douve at Ste. Colombe and, as soon as possible, push west and seize the high ground in the vicinity of St. Pierre – d’Artheglise. The 47th Infantry Regiment was to swing south, passing through the 82nd Airborne Division bridgehead at St. Sauveur-le Vicomte, and push southwest to cut off the escape corridor between the Prairies Marecageuses and St. Lo – d’Ourville. The defense against attack from the north was to be taken over progressively by the 39th Infantry Regiment and then the 90th Infantry Division. Since the 39th Infantry Regiment was still engaged at Orglandes and it was not known how soon it could relieve the 47th Infantry Regiment, General Eddy ordered part of the 47th Regiment left east of Ste. Colombe to block the roads with infantry and antitank guns. The 39th Regiment was ordered to hasten the clearing of Orglandes by shelling the town with 4.2-inch mortars if artillery could not reduce the opposition there. That night (16th of June) enemy machine-gun fire forced the 1st Battalion, 39th Infantry Regiment, to withdraw from Orglandes. In the morning the town was shelled, and at 0730 Companies A and B entered and cleaned out the remaining resistance. The 3rd Battalion moved up to the Biniville – Hautteville area to take over the defenses from the 47th Regiment. In the afternoon the 1st Battalion (minus Company C) was attached to the 60th Regiment. The 60th and 47th Infantry Regiments meanwhile made spectacular progress westward in their drive to seize the principal roads leading out of the Peninsula along the western corridor, thus cutting the Peninsula. On the 17th of June the two Regiments moved generally along the axis of the two main east-west roads. The 60th Regiment struck from Nehou west toward St. Pierre – d’Artheglise and Hills 145 and 133, which dominated the entire countryside, including Barneville-sur-Mer. The 47th Regiment moved south to St. Sauveur-le Vicomte and then southwest along the highway toward its objective, the intersection northeast of St. Lo – d’Ourville. Enemy forces west of the Douve River were believed to be small, but had not been identified. Vehicular traffic, observed moving southward out of the peninsula and westward from St. Jacques-de-Nehou, gave no clear indication of enemy intentions. Freed for a new mission when one Battalion of the 39th Regiment took over Hautteville during the night, the 47th Regiment began moving toward St. Sauveur-le Vicomte at 0500 on 17 June with the 3rd Battalion acting as advance guard in the column of Battalions. Opposition was light, although enemy riflemen and an antitank gun west of St. Sauveur-le-Vicomte caused a slight delay. From this point the 1st and 2nd Battalions moved directly west to Hill 110. 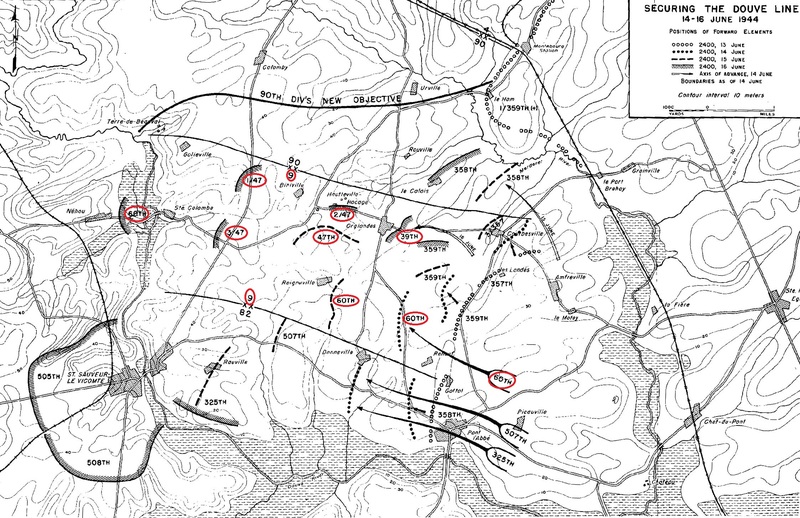 The 3rd Battalion turned southwest to Hill 90, where it was held up by enemy resistance until mid-afternoon. It continued west for several thousand yards and then cut south to the highway intersection. The 2nd Battalion crossed Hill 110, advanced south to the highway, and then pushed on toward Canville after a sharp fire fight in the evening with enemy delaying units. At 2200 the 1st Battalion reached Grande Huanville and cut the la Haye du Puits – Barneville road, the last main exit from the Peninsula. These advances had been pressed vigorously on verbal orders, and the Regiment was already at Hills 110 and 90 when Division Field Order No. 3, naming these as objectives, was issued at 1500. The Regiment was then given further verbal orders to continue its drive and completely block the corridor between St. Lo – d’Ourville and St. Sauveur-de-Pierre-Pont. Meanwhile the 60th Regiment moved out in column of Battalions from its bridgehead at Ste. Colombe at 0600. The enemy had evacuated Nehou and the columns moved down the Nehou – Barneville highway without encountering any resistance except from small straggler units. An entire enemy field artillery Battalion was captured by the 1st Battalion, last in the column. Late in the afternoon the 1st Battalion, 39th Regiment, joined the column pushing west and by nightfall all four Battalions were strung out between the Douve River and the sea. The 3rd Battalion, 60th Regiment was driving toward Barneville-sur-Mer; the 2nd and 1st Battalions were pushing westward through St. Pierre – d’Artheglise toward Hills 145 and 133, respectively, which dominated the Barneville-sur-Mer – Bricquebec highway; and the 1st Battalion of the 39th Regiment was nearing St. Jacques-de- Nehou. The progress had been so good all day that General Collins ordered the 9th Infantry Division to go as far as possible that night and to complete the sealing off of the Peninsula. At 2210 General Eddy, passing the 60th Infantry Command Post group on the road, said: “We’re going all the way tonight!” The 3rd Battalion received verbal orders to continue to Barneville-sur-Mer and cut the coastal road there; the 1st Battalion, 47th Regiment, was already astride that road farther south. Road blocks were established at the crossings of the Seye River, north of le Valdecie, to protect the Division’s line of communications. The 47th Infantry Regiment was also ordered by General Collins to push on, and at 2300 the 3rd Battalion, under Lieutenant Colonel Clayman, resumed its march southward toward St. Sauveur-de-Pierre-Pont to secure the east edge of the corridor and block the secondary road through this village. Passing over lanes and trails so close to German positions that enemy voices could be heard at times, the Intelligence Section, leading the column, was finally challenged. Its twelve men opened fire with tommy guns and a short fight ensured, which involved part of Company L. The enemy outpost was at last overwhelmed and the march was resumed. Company K led the column to St. Sauveur-de-Pierre-Pont. Resistance around this town was cleaned out the following day. The actual cutting of the Peninsula was accomplished on the night of the 17th of June. The 82nd Airborne Division had secured control of the causeway over the Prairies Marecageuses south of St. Sauveur-le Vicomte. The Barneville-la Haye du Puits highway had been cut at Gde. Huanville by the 1st Battalion, 47th Infantry Regiment , and the 2nd and 3rd Battalions were progressively plugging the Canville – Neuville-en-Beaumont gap, eliminating the remaining enemy forces around these two towns and St. Lo – d’Ourville the next day, 18th of June. In the 60th Infantry Regiment’s zone the Barneville-sur-Mer mission was undertaken by the 3rd Battalion, led by Company K riding 5 tanks (Company B, 746th Tank Battalion), 4 Tank Destroyers (Company A, 899th Tank Destroyer Battalion), and the 4 half-tracks of the anti tank platoon. At 2200 they jumped off from the crossroads south of le Valdecie, moving southwest on the main highway. Two miles west of the line of departure an enemy antitank gun knocked the tracks off the leading tank destroyer. After some delay the force moved on, but at the crossroads north of St. Maurice it unintentionally continued southward to Villot, arriving at 0200. After a patrol had narrowly missed an encounter with an enemy bicycle force, the Battalion advanced northwest along a ridge toward Barneville. Reaching the nose of the ridge at 0500, the troops could look down on the town, which appeared deserted. While the other units of the 3rd Battalion remained in position to cover from the high ground overlooking the town, Company K entered with the tanks, the tank destroyers, and a platoon of heavy machine guns. A few German MP’s were taken prisoner. During the day the enemy made no concerted attempt to regain the town, although brief fire fights developed with small enemy groups which intended to pass through the town and were surprised at the presence of the Americans. At 1000 about 125 Germans attacked from the southeast but were beaten off by Company L, which took 85 prisoners. At the same time, to the north and east, larger enemy units tried to break through the 60th Infantry Regiment’s string of positions extending from Barneville-sur-Mer through Hill 133 (1st Battalion), Hill 145 (2d Battalion), and St. Jacques-de-Nehou (1st Battalion, 39th Infantry). An attempt to slash through the Bricquebec-Barneville road by a column of Infantry and artillery vehicles was disastrous for the enemy. All available guns of the 60th Field Artillery Battalion were concentrated on the head of the column when it was first observed west of Hill 14, and the fire was then adjusted to creep five miles up the congested road. Infantry and antitank fire joined the artillery. The heavy fire destroyed thirty-five vehicles (including trucks, half-tracks, cars, and a tank), ten guns, and numerous machine guns and mortars, as well as wagons, trailers, motorcycles, caissons, bicycles, and horses. Other enemy columns were stopped and destroyed at road blocks north of le Valdecie. Several staff officers of the 77th Division were captured in one of the columns. The most serious threat to the 9th Division’s northern flank developed north of St. Jacques-de-Nehou, where the 1st Battalion, 39th Regiment (Lieutenant Colonel Tucker), had gone into position on the night of 17th of June. Attached to the 60th Regiment’s reserve, following the capture of Orglandes, it had not received any definite mission other than to follow the 60th Infantry, presumably to aid in protecting the Division’s lengthening northern flank. The Battalion finally settled down for the night at 0200 in position astride a road running north from St. Jacques- de-Nehou. The position commanded the draws to the front, but the flanks were unprotected. At 0430 heavy machine-pistol and machine gun fire was heard. It seemed to cover the entire Battalion front. Riflemen in Companies A and B began to return the enemy fire and were able to fight largely from their bivouac positions. Machine guns and mortars were quickly unloaded from vehicles and started to fire without observation. In the darkness, which made it difficult to find targets, a hot fire fight developed, the enemy advancing at times to within grenade-throwing distance. But the riflemen gave no ground, and 900 rounds were fired by the mortars, sometimes at ranges of 20 yards. Fighting at close quarters, one machine gunner found his fire masked by a herd of cows. A sergeant in Company A attempted to clear the cows from the line of fire by throwing stones and shell-cases. Finally he gave up. “Mow ’em down, Mike“, he told his gunner. Despite this heavy fire the Battalion’s position remained precarious. It had no anti tank guns and no artillery support. The 60th Field Artillery Battalion, endangered because of its closeness to St. Jacques-de-Nehou, displaced during the enemy attack. As the enemy continued his thrusts and a breakthrough on the right appeared a possibility, Colonel Tucker ordered a withdrawal south to positions near an east-west road running into St. Jacques-de-Nehou. With the heavy weapons covering, the rifle platoons disengaged one by one and later the heavy weapons were moved back another 400 yards. Drivers had taken their vehicles to Blandamour earlier. Communication with higher headquarters was established only after the withdrawal, when the Division wire was finally located. General Eddy approved the withdrawal but ordered the Battalion to hold its new line and promised support by a Division Artillery concentration. When the plight of the Battalion was made known to Corps, General Collins directed the 79th Division to move an Infantry Battalion via motor to the vicinity of Ste. Colombe. This order was countermanded, however, when General Eddy had become satisfied that Colonel Tucker’s men were in no immediate danger. Colonel Tucker had already made plans to counterattack with Division artillery support. Shortly after 0900 the artillery fired a “zombie” and the 81- mm. mortars fired their entire basic loads of ammunition. As a result, when the riflemen moved out, they were able to push straight through to their old positions-and drove the enemy back to the Seye River. In all, the Battalion suffered 39 casualties during the enemy attack and 4 or 5 in the counterattack. In the drive back to ground previously held, 60 German wounded were taken and 250 dead were found scattered at scores of points. The cutting of the Peninsula by the 9th Division marks the end of a phase in the VII Corps’ operations in the Cotentin. With the southern flank of the Corps secured, and the remaining German units bottled up in the Peninsula, the Corps could now make a coordinated attack northward to its final objective, the port of Cherbourg. On the 18th of June General Eddy commended his troops for their accomplishment, and General Montgomery, commander of 21 Army Group, sent personal congratulations to the VII Corps commander on the “roping off” of the Peninsula. Source: “The American Forces in Action Series” book “Utah Beach to Cherbourg”.